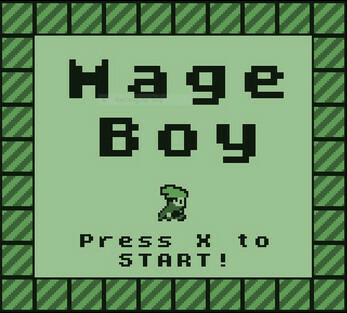 "Mage Boy is a young wizard-in-training who is learning the magical ropes from Master Otomayim, the pretty good and stronger-than-average. Mage Boy is a top-notch apprentice, except for the fact that he is constantly misplacing the different spellbooks that he's supposed to be studying. If he doesn't find all of the spellbooks before Otomayim gets back from his business trip, Mage Boy can kiss his future wizard career and lucrative children's book deals goodbye! Mage Boy is going to have to use his brain, his trusty floating cape, and the different spells he finds in order to explore Otomayim's castle to collect all 21 spellbooks before teach comes home and gives him an earful. Can you help him get the job done before his 15 minutes of infamy are up?" 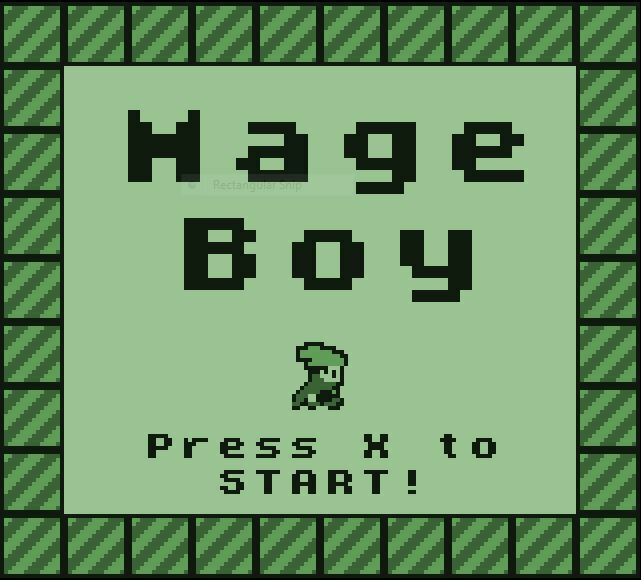 Mage Boy was designed to mirror those old, convoluted puzzle-platformers that the Game Boy always seemed to be drowning in, from the superfluous story to the pea-green tinge to the chunky, screen-filling protagonist. It's also my very first game jam game, which was an awesome learning experience but also tells you that this game is ruff like a dog.